Haruki Murakami’s short story characters in After the Quake confront their emptiness when the massive 1995 Kobe earthquake in Japan becomes a turning point in their lives. “I call it Landscape with Flatiron. I finished it three days ago. Zen Buddhists believe that Buddha Nature – the true nature of reality and being – is impermanence, becoming, and a vast emptiness. And Satori,the sudden flash, leads to great insight into the vast emptiness. The earthquake provides Murakami’s characters with that sudden jolt providing insight into the emptiness…insight to grasp how an iron is more than an iron. Last weekend, we visited our friends at Live Power Community Farm in Round Valley, California, where master farmers and apprentices continue in the footsteps of Alan Chadwick to sow and reap a bountiful harvest according to the principles of Biodynamic farming. Words cannot adequately describe the deep connection one forges with the land and the community when working side by side in the fields, making and sharing meals, and sleeping outside in the hay barn near to dozing horses, cows and sheep. It is sublime. Arriving at the farm, we felt like understudies in a play whose curtain rose hours ago. We found ourselves reading lines in a well-thumbed script; and one of the acts was about this farm besieged for weeks by bobcats. Two weeks ago there were over forty egg laying chickens in the hen house; today there were less than nineteen. Eggs provide needed protein to feed the farmers. Late afternoon, we were hoeing and raking beds for planting, when news reached us that a bobcat had been caught in the trap near the horse pasture. We walked to the trap, fascinated and horrified at what we might find. There in a cage was the proud and beautiful creature, watching our every move, so alive, and so intense. This was the villain of the act in this play, but it was not really a villain, it was something else. 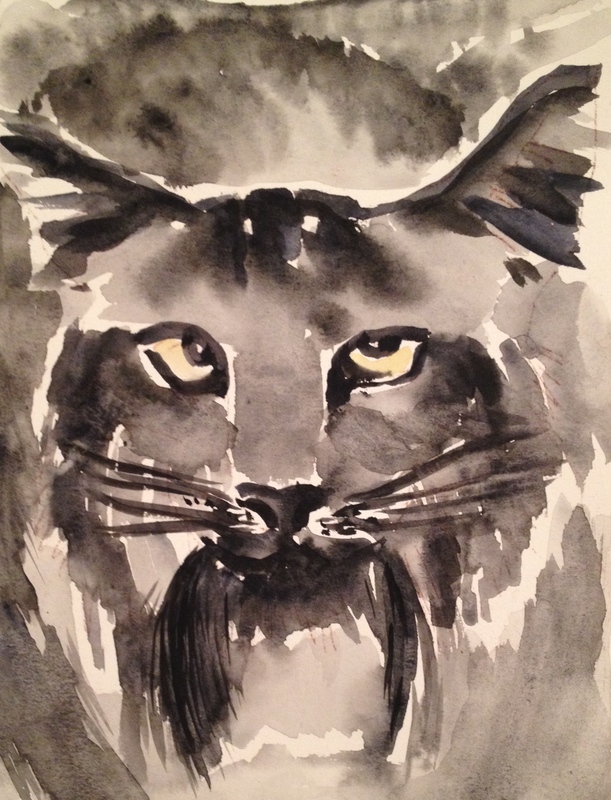 Our proud and beautiful bobcat would not live to see another sunrise, and that reality was like the sudden jolt of an earthquake providing insight into the true nature of reality and being, the impermanence, the becoming, and a vast emptiness. A coincidence, but a 6.0 earthquake occurred in Napa, California the next day; jolting our world with insight. And now a week later, while absent, the bobcat remains with me. And like the negative space in a painting, the absence of the subject, and not the subject itself, has become the most relevant, and the real subject of this story. It is the journey to understand the importance of impermanence, becoming and emptiness.